Coral Bet and Get Club - Get a £10 free bet every single week! Join the Coral Bet and Get Club for £10 free every week! Coral’s bet and get club is a rewards bonus that has got punters talking. In a market seemingly obsessed with fighting over new sign-ups, this deal goes against the grain, rewarding those loyal to the brand, and have been for some time. We say – well done! Let’s look at just what’s good about Coral’s bet and get – open to both new and existing customers, this gives you a £10 loyalty bonus for betting through the week. All you have to do to get your hands on the £10 free bet is place at least £25 worth of bets on sportsbook markets between Monday and Thursday – how easy is that? Well, very is the answer. These days you often have a Premier League football match on Monday, Champions League fixtures on Tuesday and Wednesday, Europa League Thursday, Friday night from the Championship and Scotland, and then we’re back into the weekend. Not to mention daily horse racing from around the UK. So, surely this is a bonus that rewards you for doing the basics? How does the Coral Bet and Get club work? What’s even better about Coral’s poster offer is you can get your hands on a £10 free bet every single week, as long as you are placing the £25 Monday to Thursday. Firstly, opt-in to the bet and get scheme on the Coral site, you’re then ready to reap the benefits. Here’s the finer details worth knowing, ensuring you get the most out of it. The clock starts ticking at 00:01 on Monday, and ends at 23:59 on Thursday. In that time every bet counts towards your £25 qualifying amount – as long as your selections have odds of even money or greater. That’s to ensure no one’s trying to cheat the system with odds on shots, waiting to get their bonus. 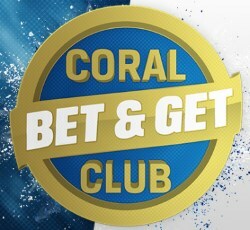 You’ll need the Coral Connect card to get the benefit as, at 18:00 on Friday, they will credit your £10 – £5 to be used on any market online, and £5 to be used in any of Coral’s many betting shops across the UK. £5 bets must be placed on markets with a 1/2 price or better, and it has to be used as one bet, ie one £5 stake, so can’t be broken down into five £1 bets. All pretty standard stuff, and all easy enough to follow. When working towards your £10 free bet, please remember that qualifying bets that are cashed out do not count. So, for example, you’ve placed a £10 acca on Tuesday’s Champions League matches, and the cash out option is looking healthy. If you bite and take your winnings, the £10 stake doesn’t work towards the £25 total. With the free bet, cash out is not an option here either, you’re being given a chance to take a shot at a selection you fancy, and must see it through to the end, like the good old days. Remember backing an accumulator because you thought all the selections would win? That concept seems alien to punters now. Great news for those who like to dip in and out, depending on the sports schedule. There’s no commitment here. Place £25 worth of bets in a week once and get the £10 free bet, miss it for a couple of weeks, and Coral will allow you to pick back up where you left off, working towards the bonus again, like you’ve never been away.